Heirloom tomatoes in their vibrant colors and odd shapes are a delightful taste from the past. This is what a tomato should taste like! 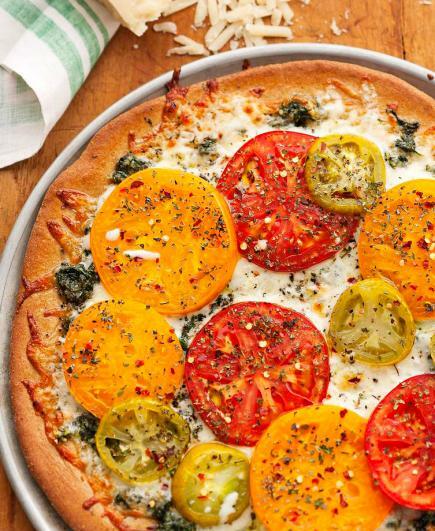 Pare them with pesto on a whole wheat or gluten-free pizza crust, and you have a delicious, healthy meal. 2. Spread Kale Pesto evenly over crust. Sprinkle with cheese. Arrange tomato slices over cheese. Sprinkle with pizza seasoning. 3. Bake about 8 to 10 minutes more or until heated through and crust bottom is crisp and brown. (Or grill as directed.) Remove from oven. Cool in pan on a wire rack for 5 minutes. Cut into wedges to serve. Makes one 13- to 15-inch pizza (four 2-wedge servings). 1. Using 1 pound fresh kale, remove leaves off stems; rinse leaves. In a Dutch oven, bring water to boiling. Drop leaves into water and cook, uncovered, for 3 to 5 minutes or until tender. Rinse leaves under cold running water; drain well. Wrap leaves in several layers of paper towel or clean kitchen towel and squeeze out excess moisture. Coarsely chop and measure for 2 cups. 2. In a food processor or blender, combine the chopped kale, freshly grated Parmesan cheese, walnuts, garlic, and salt. Cover and process or blend with several on/off turns until a paste forms, stopping the machine several times and scraping the sides. With the machine running slowly, gradually add olive oil and process or blend to the consistency of soft butter. If you're not serving the pesto immediately, divide it into five 1/3-cup portions. Place each portion in a small airtight container and store in the refrigerator for up to 2 days or freeze for up to 3 months. Makes 1-3/4 cups.